I left Vermont on May 29, my car filthy from having sat through the winter, driven only once every couple of weeks. I was almost grateful for the pounding rainstorms I drove through the first two days of my trip to Yellowstone, as they washed the worst of the grime from the vehicle. But now, in late June, my car is once again as dirty as ever. My bike, my front porch railing, the neighbors’ folding camp chairs—all are coated in a fine, yellowish powder that adheres stubbornly to every exposed surface. Puddles in the housing area are rimmed with miniature beaches of pollen; the yellow dust makes psychedelic patterns on the surface of the water. And this morning, the inevitable: I started sneezing. It’s lodgepole pine pollen season at Old Faithful. The tall, slender trees that are so ubiquitous here in Yellowstone are in a mating frenzy, the little male cones at the tips of most branches casting unimaginable quantities of pollen onto the wind. Only a tiny fraction of it drifts into contact with a receptive female cone, where it can perform its fertilization duties and get on with the business of making baby lodgepoles. 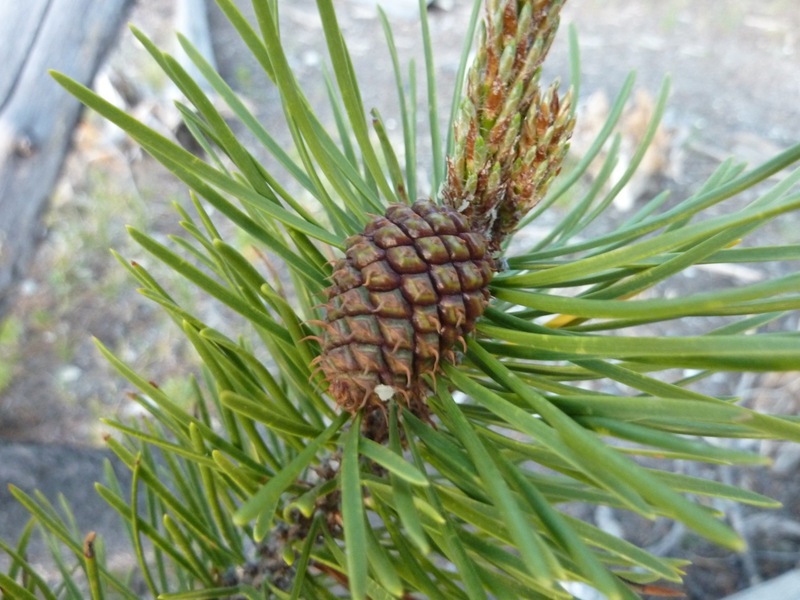 This immature female cone was fertilized last year. Despite the long odds for any single pollen grain, lodgepoles have been incredibly successful here in Yellowstone: about 80% of this national park is forested, and about 80% of those trees are lodgepole pines. The lodgepole’s success is due in part to its ability to manage the shallow, nutrient-poor, excessively-drained soils of decomposed rhyolite that dominate the park. Lodgepoles also famously sport an adaptation to the frequent fires of this ecosystem: they are capable of producing serotinous cones that persist for years on the tree, held sealed by a waxy resin until the heat of a fire opens them to release their tiny seeds. Though my father has suffered from hay fever for as long as I can remember, I have never had allergies of any significance. Despite my annual June sneezefest and watering eyes, I remain unsure if I’m actually having an allergic reaction to the lodgepole pollen. It may be that the sheer quantities of pollen merely act as dust particles to irritate my eyes, nose, and throat. I’ve read that lodgepole pollen is one of the least allergenic of all pollens. Allergenic or not, I can say this for lodgepole pollen: it’s very effective at dispersing. I just wish less of it dispersed into my sinuses!